Portsmouth launched the new 08/09 blue kit, with gold trim, which will be worn for one season only to mark the club’s 110th anniversary. This special shirt includes an embroidered redesigned team crest with 110 years, CCC logo, and sponsor logo on center chest. 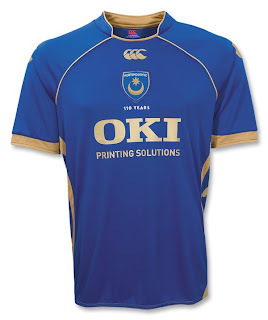 “The all-blue strip will commemorate the 110th anniversary of Portsmouth Football Club. “When the club reached 100 years, difficult financial circumstances meant it was not possible to mark such a historic date significantly. “But the huge advances the club has made in the last two-and-half years mean we can now do that for our 110th year. “The all-blue strip already has fantastic connotations. We won our FA Cup semi-final against West Brom – played on the exact 110th anniversary of the club – wearing all blue. “And then, back at Wembley, we won the FA Cup final against Cardiff wearing all blue. “The club understands the importance of colours to fans. That’s why we consulted with supporter groups before the decision to wear all blue for one season was made.